I made a beautifully iced sponge cake for my grandfather's 90th birthday. He blew out the candles, thanked everyone after we sang 'happy birthday' and then proceeded to cut the cake... it was made out of sponge rubber! P.S. I had a spare cake to eat for grandfather and guests, equally as beautiful. Sorry no pics - that was in 1996. Sadly he's gone now but we all still tell that story on his birthday anniversary. My pastor knew I like to put a puzzle together during the Christmas season (a mom/daughter tradition my mom started). So, being the kind, thoughtful person he is--he bought me a puzzle. He thought it would be funny, though, not to include the box it came in or any type of picture of what the puzzle picture was. He told me to have fun with it. I put the puzzle together quickly (before that Christmas arrived) and took a picture of the puzzle (to prove I did get it together). Then I proceeded to spray paint the puzzle white and took it back apart. I then gave it back to him saying in his card: Here is a picture of the puzzle you gave me; it WAS fun. And here is a puzzle for you! And you'll notice I included a picture of what it will look like (because I'm more thoughtful than you). I then cut a small rectangle of white paper (as the puzzle picture) and told him it was called "White Blizzard" or "Snow Storm" or some such nonsense (it's been a few years ago). He thought it was hilarious (but didn't even attempt to put it together (wimp). That was years ago, and we still joke about it as the start of our gifts to each other. Now we've got an ongoing tradition of gag gifts going on every Christmas--and sometimes at other times of the year, too! My cousin wanted some Tommy Hilfiger boxers several years ago. Being the jokester my dad is, he took an old white pair of his (equipped with holes and all) and wrote with a sharpie "Tommy Hillbilly" on the waistband and drew the symbol. He had wrapped the real Tommy Hilfiger boxers separately but it was a good laugh for everybody! Families are like fudge... mostly sweet, but with a few nuts! My brother, my sister-in-law and my best friend. A 2"X3" block of wood, a woodsie, acorns, a magnet, clear nail polish, and some ribbon. I drilled a small hole in the center of each acorn cap. I then painted the caps. When dry, I knotted a piece of ribbon with the knot being on the underside of the cap and glued the cap onto the acorn. I then painted the block of wood red. I glued the printed verse onto the woodsie and drilled a small hole in the bottom corners. 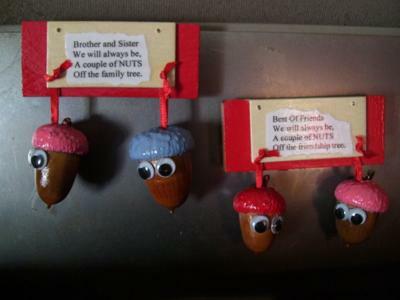 I pulled the ribbon on each acorn through the hole and glued the woodsie to the block of wood. I coated the entire project with clear nail polish, including the acorns. This gives it a nice shiny appeal. 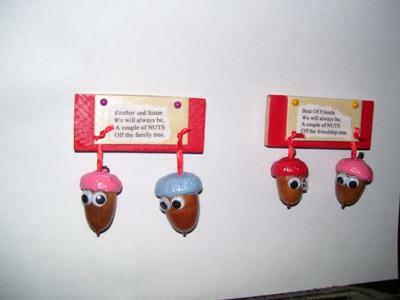 I then glued google eyes on the acorns and attached a magnet to the back. A couple of nuts off the family tree! A couple of nuts off the friendship tree! I also made a card to go with the gift. I drew ice cream with fudge and glued google eyes on the fudge. 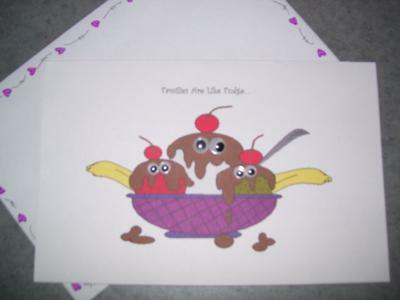 The front reads,"Families are like fudge". The inside reads,"Mostly sweet, with a few nuts!" When you gather from nature, it's free and you can do a lot with "found" objects so I already had acorns in my supply. I also had Woodsies (purchased at Michael's or Walmart) and I always keep a supply of these wood blocks. I purchase them from Woodworks Ltd. Their web address is: www.craftparts.com. I made this fun survival kit for 10 of my girlfriends. Aside from Christmas, Valentines Day is my favorite holiday. 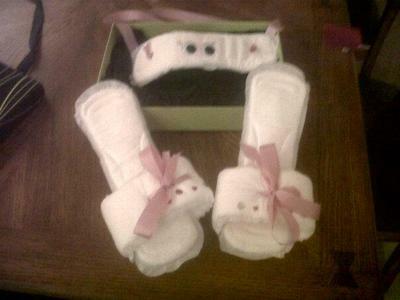 Coming up with a new and interesting gift for my "gals" is always a fun challenge. 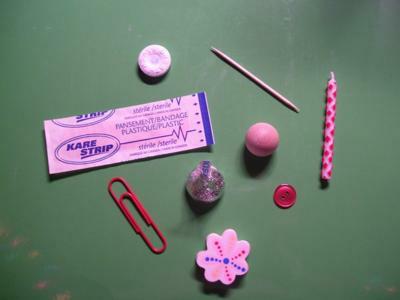 I put these contents in small valentine party bags. This project was very inexpensive because I already had these objects in my home but they all can be purchased at a Dollar Store. I also personalized each bag with a foam heart and strung letter beads that spelled out each girl's name. I bought small clear valentine party bags (25 for $1.00) at Dollar Tree. I filled each one with the contents listed. 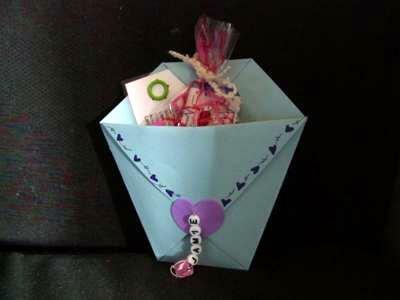 I chose to use the "Pocket Origami Gift Box" that Stephanie has in her section on Origami. I used different colors of cardstock to make these pockets because I required a stiffer one that would survive the mailing process. The power is very strong. And you never will go wrong. Hang tough, for they too, shall pass. Who thinks you're top "A" class! To pick out the good qualities in people. To help you "hold it together" during difficult times. To help you remember the power of hugs and kisses. To help remember the times one should button their lip. To help with life's hurt feelings. To erase away any mistakes you make that you want to forget. To light your way when things are their darkest. For the times you feel you've lost all yours. For the times others will need your help and you will need theirs. I chose to put my contents in purchased party bags but you can use baggies. Just put in contents, gather bag above them and cut off excess. 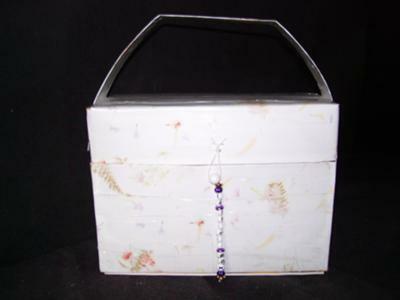 This gift is virtually free of cost because most of the objects it contains can be found at home. This Origami Pocket is adorable and VERY easy to make. I drew little hearts for trim on mine but the ideas on how one can use them are endless! Give it a try... it's addictive! For the bubble bath get 1 can of baked beans with a tag reading "Bubble bath - Eat one hour prior to bathing". 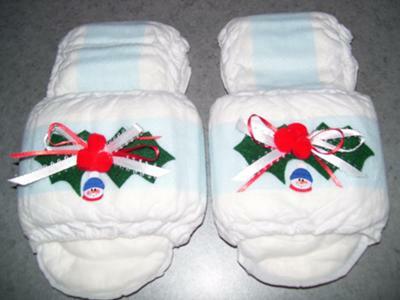 For the comfy slippers get 4 maxi pads, lay one out flat (adhesive side down but leave the paper on) and hot glue one in an arch to the top/sides of the first one, then repeat with the other two. To give them a little color, decorate these with glitter, sequins, or markers. For the eye mask take one maxi pad and hot glue a string to the back on each end so that there is a loop to put around your head. I also decorated the "eye mask" to match the slippers. I have a group of friends that celebrate birthdays together. They have all enjoyed the "Survival Kits" that I put together for their birthdays when they turn an age with a 0 on the end. So everyone knows you're the Queen in Town. To give you some much needed peace of mind. Just in case it's a day you're not on your toes. Take your cell phone, if not, you're doomed. All items you can purchase at the dollar store. Wand is in children's as well as crown. Stick a bow on top and you're done. I made this gift for my sister because she would not tell me what she wanted for Christmas. She just laughed and blushed now she always tells me what she wants! I gave this as a house-warming gift. A couple of friends of mine were moving into a new flat, and had complained that the landlord wouldn't let them keep a pet. Not that they had a pet anyway, but it's the principle of the thing, right? So for the house warming party, I gave them a pet that they would be allowed... a dust bunny! I collected the dust from under my bed (ewww) and put it in a shoe box with some breathing holes punched in, and labelled it "Pet Bunny - my name is Dusty". As you can imagine, they didn't know what to make of it at all when the saw the labelled box. But when they opened the lid they realised what I'd done and we all had a laugh. I don't think they kept Dusty though. Poor little guy. I think they are quite dandy. They'll cushion your feet quite handy. Well, friend, don't you fear. To mop up all your tears! Just gave them to my female friends and they got great reactions! A couple of years ago, I took 4 corner pieces of my sons puzzle and cut them out of wood, sanded them down and stained them to make them look really nice. Although there were 4 pieces to the puzzle, they did not match. My pastor and I exchange 'gag' gifts each year. One year he gave me a "Whitman" sampler (small box of candy with four chocolate covered candies). Sounds good, right? It was a very thoughtful gift since Whitman's is a good brand of candy, but he took a bite out of each piece of candy, put them back in their little spot and rewrapped the box! Nice pastor, huh? I appreciated it and went on to my next 'gag' gift for him. My husband adores Smartie sweets, (like M&M's but nicer) and will eat a whole box or large tube in an evening if we let him. So one Christmas I thought that I would encourage him to eat them slightly slower. I individually wrapped each Smartie in a twist of tissue paper and re-packed them in a much larger Christmas card box. I wrapped the box, labeled it fragile and gave it to him on Christmas morning. He was quite surprised to unwrap a box of Christmas cards but when he saw what was inside he burst out laughing. Everyone thought it was a fab joke. His only complaint was that it took ages to unwrap the sweets but not as long as it had taken me to wrap them! So I got this lovely little box, bought a package of baby carrots and put three of them in the box and wrapped it up beautifully. That gift was left til last. I handed her the box and told her that my son had something very special for her but asked me to give it to her. She looked at the box and said "Oh my word... oh my word... thinking it was that special box she opened it... and cracked up laughing as did the rest of the family... Was fun!! It was the last gift for me to open, I was looking forward to getting an IPad for Christmas. The gift was flat and the right size. I ripped off the paper, and found my IPAD! Everyone burst out laughing. 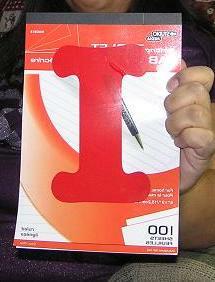 My husband had gone to the dollar store and bought a regular lined notepad, and on the front he had stuck a Giant Capital "I", so I got an "I" pad for Christmas. As I was waiting to see my dentist I started talking to the girl behind the counter. She told me about a Christmas gift she got from one of their patients last year for Christmas. He came in for his appointment and handed her a bottle painted black so she could not see inside it, it had a label that said "Stool Sample." She told him he was in the wrong doctor's office for that and he laughed and told her to open it, it was her Christmas gift. a tiny three legged stool. It's so much fun to read the gag gifts and I would like to thank all for their ideas because I combined some to make this gift for my sister-in-law for Christmas. Here's a short explanation of what happened that became the idea for this gift. Recently she went for a check-up and the doctor told her that she was "pre" diabetic and deficient in vitamin D. He explained that this was quite common for people in their 60's (she's only 57, ouch!). He couldn't tell her she had to lose weight because she only weighs 105 LBS, soaking wet, so he suggested she should start aerobic exercise. It just so happens doctors tell me the same two things, so when she called me, upset by this visit, I told her that they tell me that too. This helped. (I guess misery loves company). This is when the light bulb came on in my head... for laughter IS the best medicine! This is what I did. For days that bring you stress. Than smiles, which are the best!" Bubble Wrap Capsules: I cut squares of bubble wrap and wrapped them with this card on it. Instructions: Pop one sheet per day. Call Sister if symptoms persist. Sanity Pills: I used an empty aspirin bottle and filled it with her favorite candy. I put this label on it. Instructions: Take one tablet as needed. If stress gets too high, TAKE THEM ALL! Wrinkle Cream: I hung this card off a small tube of chaulking. There's no changing this fact. To fill in all those cracks! For a day when John gets on your nerves. Use the Perfect Man enclosed. He's rich, he's sweet and if HE misbehaves, you can BITE HIS HEAD OFF!!! Relaxation Book: I found one at a thrift shop and cut out a rectangle in all the inner pages. Then I set one of those miniature bottles of vodka in the hole. No further explanation needed! 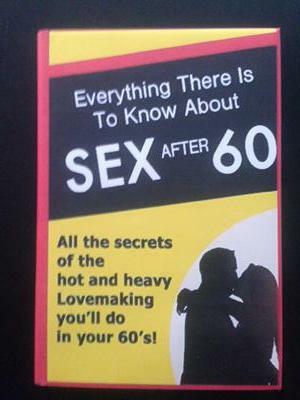 Aerobic Exercise: Since the doctor told her to start aerobics, I took a small block of wood and added this card. 2) Run around block 2 times each day. 4) Repeat once a day until next doctor's visit. 5) Tell doctor that you run around the block twice every day! I am also going to get some foam stick on letters and put every "D" all over box so she won't be "deficient in D" anymore! My sister-in-law is a dream to give handmade gifts to. She treasures them and keeps every one forever! I'm sure we will have a great many laughs over this one! Thank you dear sister-in-law and many thanks to the readers who submitted these gag ideas. Keep the ideas coming! This gift is some small sized whoopee cushions sewn into some slippers discreetly! They made my whole family burst out in laughter and my Nan actually wears them! A very special pair of glasses to help you become more level headed. Get cheap pair of glasses/spectacles from a discount store and glue on a spirit level. Now, the recipient can look in the mirror and tilt their head left and right and aim to get the bubble right in the middle to ensure that they're level headed! I have a tradition with my brother where I buy him chocolate covered cherries every year, so last year I decided to play a prank on him. Instead of his usual cherries I got him a bag and inside it I put a jar of cherries and a block of chocolate, and a little note saying that chocolate cherries were all sold out so he'd just have to make his own. My brother (who is usually the king of pranks and the one playing pranks on me) loved it and got a good laugh. 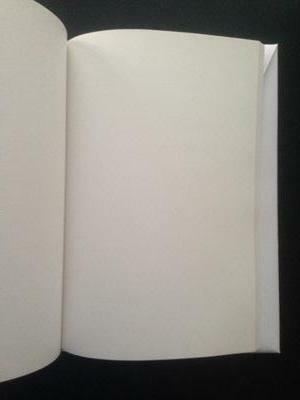 You need a hard cover notebook with blank pages, a printer and some thick paper (I used 120 g).